Today, I want to write about a cool and really big animal, the giant manta ray. They are the largest species of ray in the world, with some adults measuring up to 25 feet long and weighing up to 1,350 kg. Despite their size, they are able to leap completely out of the water, which would be a spectacular sight. They look scary, but the giant manta ray feeds on very small plankton, using filters on the inside of their gills to gather food from water that they swallow before it passes through the gills. They have 18 rows of very sharp teeth, but these teeth are only found on the lower jaw. They have no teeth at all on their top jaw which is very weird. Due to their size, they have very few predators, with only large sharks and orcas able to kill and eat them. However, they are in danger of over-fishing from humans. Giant manta rays are found in warm tropical oceans around the world, especially near coral reefs and not too far from the shore, although they do make their way to deeper waters if they need to. 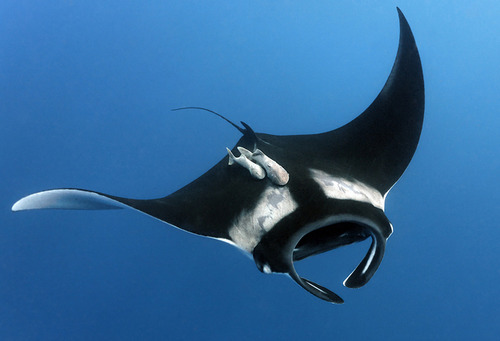 Are there any other interesting facts that you would like to share about giant manta rays?